It's a bit after 2:30am, I recently arrived home from work and now I'm on Blogger. You know what that means right? If you guessed its Friday Mashup time then you guessed right! Amanda is bringing us the challenge this week and she has a great sketch for us, plus she wants us to incorporate bunnies into our project. 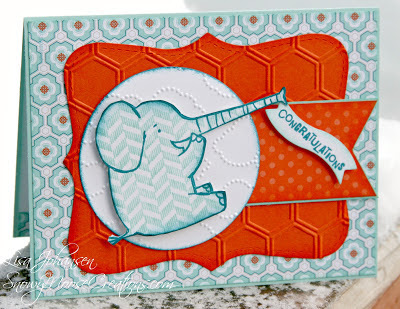 I wasn't able to mash it up this week....I don't celebrate Easter and own zero bunny stamps so I used a very cute elephant instead, from the set Henry Says, from the spring catalog. Isn't he just adorable? 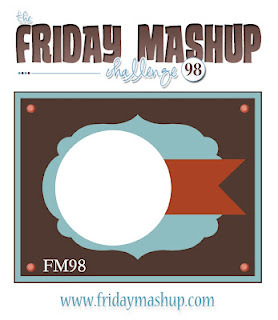 Head over to The Friday Mashup blog to see the projects from the rest of the DT! Make a project "using the Sketch". Or Make a project with "Bunnies". Or "Mash it Up" and create a project with the "Sketch featuring Bunnies". I had the same bunny stamp problem! :) Henry is just as cute. What a cute card, Lisa! Love that little elephant, so darling. This would make a great baby shower card. Beautiful card Lisa! Great colors, and I love the embossed panels. I think the Elephant works great in place of the Bunny for Easter! I love the way you gave him texture... and how you used the sketch. Your patterned elephant is soooo cute! Such bright cheerful colors too! Thanks for sharing!